Kristin and Ndiva’s wedding was one unforgettable night! 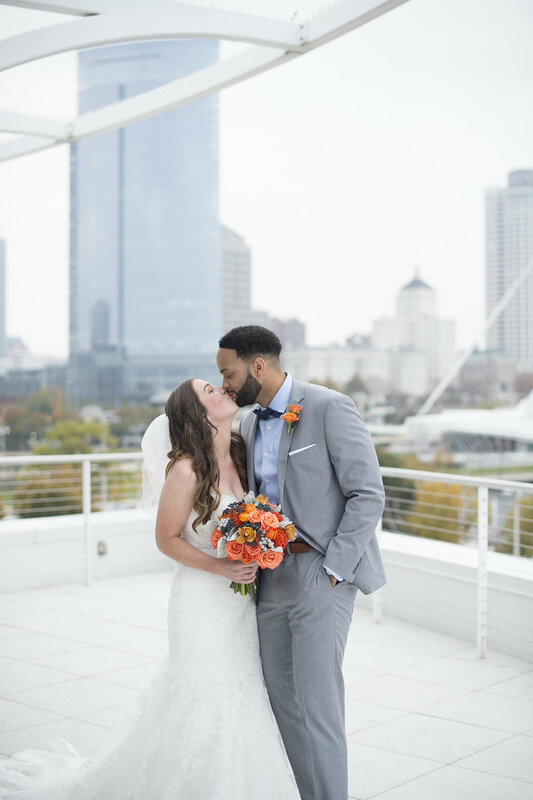 As soon as Kristin walked down the isle she made a statement with her bold burnt orange and tangerine bouquet. It was filled with different shades of Roses, Cymbidium Orchids and unique splashes of Coxcomb. They were paired with the muted greens of dusty miller and brunia. The bouquet also had hints of Navy Blue Privet Berries that matched the men’s ties and the bridesmaids dresses! The bridesmaids bouquet’s were smaller versions of Kristin’s but had only the roses and muted greens. We can’t forget the boutonnieres! Ndiva’s boutonniere balanced Kristin’s bouquet flawlessly with 2 roses and some greenery. The groomsmen all had very similar boutonnieres to Ndiva’s. The wedding was held at Discovery World in Milwaukee. The venue is mostly white and muted tones so their color scheme of navy blue and oranges really popped. The reception had blue lighting which set a cool underwater tone to the night. At each of the tables the center pieces were candles with loose floral scattered around it. The floral consisted of small orange roses paired with some green leaves. Congratulations to the newly weds! We are wishing you many anniversaries to come!